I supervise ~5 undergraduate and masters dissertation projects each year, in the areas of Computer Vision or Graphics. Project students work on topics that contribute to our team's research direction, and in some cases this has led to joint research publications. If you are considering a future career path in research, then early exposure through such a project could be a valuable `test drive' and CV experience! Some project ideas for this year are listed below, but I would supervise most projectsin Computer Vision/Graphics that is new and interesting, you are enthusiastic about, and is relevant to our research. CVSSP hosts a large studio equipped with 8 video cameras that enable us to reconstruct 3D models of actors. This project developed a parallel archiecture across 10 PCs to enable this reconstruction to occur in real-time (25 fps). The real-time 3D model pipeline was then integrated into a simple Augmented Reality game, enabling a user wearing glasses to interact with virtual objects in the studio space in a virtual game of Squash. For this work, Erik won the ECE prize for best project of 2011. For his project, Charles developed a new type of display able to deliver the illusion of immersive 3D graphics through a regular 2D display equipped with a pair of cameras. The display runs in realtime (25fps) with 120ms latency; it requires no glasses and also enables viewers to 'look around' corners and occluding objects. 3DTVs on the market cannot do this as they give the stereo illusion of depth only (and most also require glasses). The work resulted in a paper publiation at the HCI workshop co-located at the leading Computer Vision conference ICCV. The project also won the best MSc project prize for 2011. Charles later joined CVSSP as a PhD student. 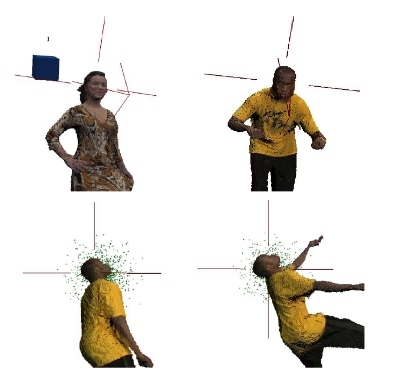 Daniel developed a passive sensing solution enabling the position and orientation of an actor's head to be estimated accurately within CVSSP's 3D studio, using views from multiple calibrated cameras. He combined face detection technology with particle filtering to track the 6 degrees of freedom of the head to within a few centimetres accuracy. This initial work subsequently fed into the CVSSP ReGaTa tracking system, which was submitted to a journal and is currently under review. This work won the best MSc project prize in 2010. Emmanouil worked on a real-time fall detection system, which could potentially lead to an elder-care solution using Computer Vision to detect falls within the home. The project harnessed the Bag of Features technologies used within our team for visual search, to deliver impact through this alternative application. We were able to demonstrate improved discrimination over shape/silhouette based fall detection approaches. The work resulted in a workshop paper publication at AMBIENT 2011. 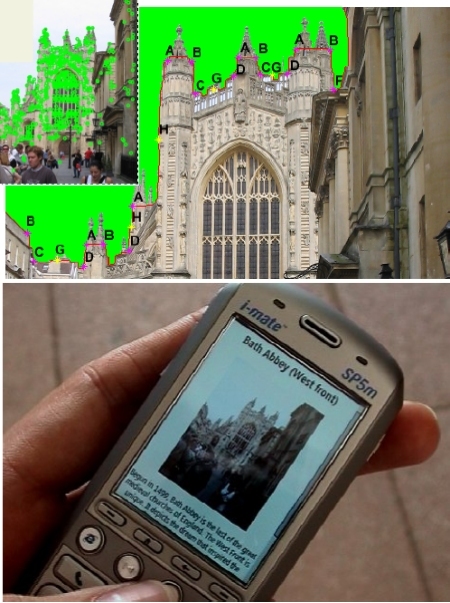 Charles developed a scalable system for recognising landmarks from photos taken on an Android smartphone. The system transmitted images to a server-side application to perform recognition, implementing and comparing 3 leading algorithms for scalable image recognition. The project ranked highest in the year for EE 2012 and won two departmental prizes for achievement. Charles has since joined our research group to undertake a PhD in scalable object recognition in video. Use this Departmental signup link to sign up for any of the following projects proposed for this coming year. More detailed specifications of the projects are also on that site. If you have a project idea of your own, contact me to discuss it. All of these projects require excellent programming skills in C and/or Matlab. You should also have a reasonable maths background and be willing to engage in guided self-study to pick up new concepts (e.g. computer vision) quickly. You may wish to take this maths and coding self-test. It is desirable but not necessary that you take EEE3032 in semester 2. This project will estimate the gender and the approximate age of a person, given a single photograph containing a frontal view of a human face. You will develop code to identify the presence of brands (via logos) in a video, and produce reports estimating total brand exposure. In this project you will write an application that accepts an image, and decides which font (out of a supplied large database of fonts) the text is written in. The CVSSP studio enables us to capture "3D video" of performers i.e. reconstruct moving 3D surfaces. We are interested in estimating the position of a stick man (skeleton) within the reconstructed 3D mesh, to determine the pose of the performer. You will implement and evaluate an idea we have for solving this problem. We have developed a technique for finding images used sketched queries. You will write a web interface to this tool and perhaps help improve the algorithm. This project will build upon the eldercare fall detection system developed last year (see left) to improve accuracy. Commerical vehicles are required to carry a Tachograph; a device that records speed and time on a tamperproof rotating paper disc. This project will run in collaboration with a external forensic scientist, to improve the PC based analysis software. This may involve reverse-engineering a microscope-PC interface, and some image processing to analyse the tachograph.